After a tumultuous year, the Ferguson, Missouri Police Department is shaking things up again. Not only has the Ferguson City Manager resigned, but the city's Police Chief is stepping down too. With all this upheaval and history being written, the future of Ferguson — a town whose social and political situation has suddenly and rapidly become a crucial benchmark for the country— is more uncertain than ever. In one sense, things are looking up for Ferguson — the publicity surrounding the death of Michael Brown last summer brought a Department of Justice investigation to the city that led to the exposure of widespread racism within the police force. In light of this new information, members of the Ferguson Police and judicial system are stepping down left and right. Ferguson's municipal judge recently resigned, and the state of Missouri has appointed a new "reform-minded judge" to hear cases in the city. But while all this change may ultimately be for the better, it certainly isn't bringing stability and consistency to Ferguson anytime soon. The results of investigations into Brown's shooting have been conflicting, not to mention often politically polarizing. On one hand, former police officer Darren Wilson was not indicted for the shooting by a local jury, and he was further cleared by the federal government on civil rights charges. But on the other hand, the DOJ's scathing report on the state of the city makes it clear that there's racism going on and the federal government knows it. So what's in the future for Ferguson? After Ferguson's municipal judge Ronald J. Brockmeyer was cited multiple times by the DOJ for abuse, the Missouri Supreme Court assigned a state appeals court judge, Judge Roy L. Richter, to oversee all municipal cases in Ferguson. Rebuilding trust in the community won't be easy. In order to make a comeback, police will have to comply with potentially expensive reform recommendations from the DOJ. In light of findings that show that the overwhelming majority of arrests in Ferguson affect black citizens, the police will have to "completely revamp" the way they handle traffic stops, searches, and arrests. Missouri Supreme Court Chief Justice Mary Russell said Judge Richter is "willing to implement needed reforms." With his appointment, the Missouri Supreme Court wants to "restore the integrity of the system." Ferguson police are the first in the country to test a new bit of technology called The Alternative, a gun attachment intended to make guns safer. While other cities are also trying out weapons for "less-lethal" police force, all eyes are on Ferguson. Though similar efforts may be underway in other parts of the country, no other city has quite the amount of public attention and media fanfare as does this one, and so the results of the Alternative tests will speak not only to the future of Ferguson, but to the future of nonlethal force efforts throughout the United States. If the Ferguson P.D. do implement the gun attachment in police training, other cities may follow suit — though the media attention has largely shown Ferguson as a negative example, reform efforts may paint it in a different light. Since the unrest began in August, business owners in Ferguson have been struggling to keep their businesses afloat. But some may be taking advantage of these citizens' difficulties — according to one report, a man named William Cheatham has been using crowdfunding to raise money to rebuild his contractor's business in Ferguson, but there is no documentation to prove this business actually ever existed. But the news isn't all bad. 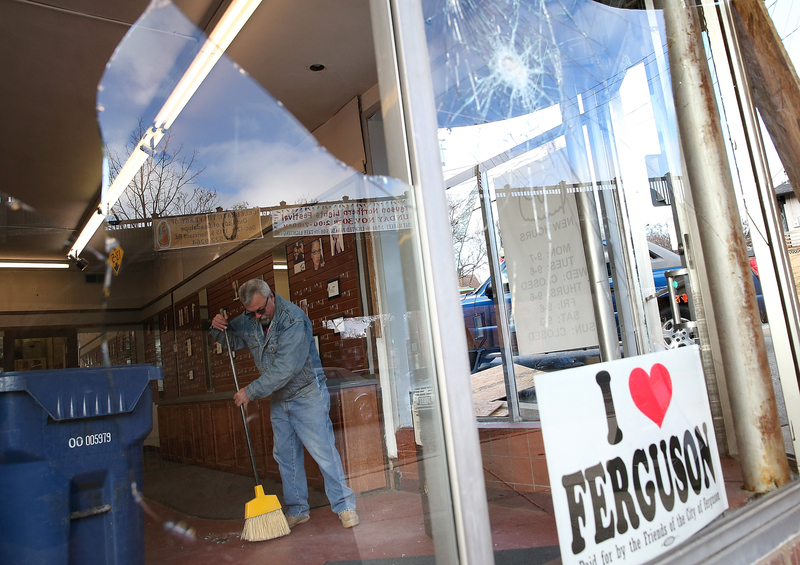 Some in Ferguson are confident about the future of their businesses. Funds like the Small Business Relief Program have helped Ferguson businesses get back on their feet with no-interest loans — though there is still work to be done. Charles Davis, owner of the Ferguson Burger Bar, said the city's problems are systematic, not personal. Davis told Fox 2 Now he likes the people of Ferguson. It's not the individuals. That's why I like Ferguson. It's not the individuals that are really having a problem. It's different structures, or different things, as you can see, according to the numbers, that are really causing the problems in Ferguson. So I like Ferguson from that aspect. Davis is unique among entrepreneurs in Ferguson — students from Fontbonne University have been working for six months to help him gain traction in a business environment that isn't always smooth and steady.